If I were the type of person who posted photographs of cute things on Facebook, would I post comical little kittens doing cute things? No. Puppies looking adorable and being mischievous? Nope. Precious babies? Not until I have grandchildren. I’d post the cutest little vegetable ever . . . the Kirby Cucumber! Who can resist those plump little cukes? Just look at them! They make you want to just pick them up and take them right home with you! And that’s exactly what I did! Kirby’s are not usually sold for more than a few weeks in the summer where I live, so when I see them I adopt buy them. Then I get them pickled right quick so I can enjoy their yummy cuteness for a little while longer. With just two of us at home and no garden space, I don’t go in for a lot of time-consuming food preservation. I like to make quick pickles which can easily be ready in just a few days. You can take this basic recipe and then add spices. You are welcome to add such things as mustard seeds, peppercorns, coriander seeds, celery seeds, garlic or whatever your pickle-lovin’ heart desires. You can also slice the cukes into about 1/2 inch slices and they will be ready to eat in a few hours. Clean glass jar with lid—I had a 2-quart jar but you can use a smaller jar or two different jars, or whatever you’ve got on hand. These babies are in a pickle! Wash and dry the cukes and slice them if desired—I like spears. I read somewhere that if you trim off the flower end of the cucumber (opposite the stem end) the pickles will be firmer and I’ve found this to be true. Put the sea salt, water and vinegar in a pot and bring to a boil. Simmer for 5 minutes and then let it cool down a bit. Stuff your cucumbers into the jar so they are packed in really well. You want them tight enough that they won’t float to the top when you add the brine and get exposed to air. Pack the sprigs of dill and the lemon shavings in there too. Pour your brine into the jar to thoroughly cover the cucumbers. Tap the jar on the counter to get rid of air bubbles. When the brine is completely cool, close the lid and put the pickles in the refrigerator. They’ll be ready to eat in a day or two and they will “evolve” as they continue pickling in the refrigerator. Eat them within about a month. You can use this type of brine for pickling other veggies too! If you’ve been reading me for a while, you may know that I’m going to recommend my favorite pickle dish, peanut butter and pickle sandwich. Nothing could be more delicious! 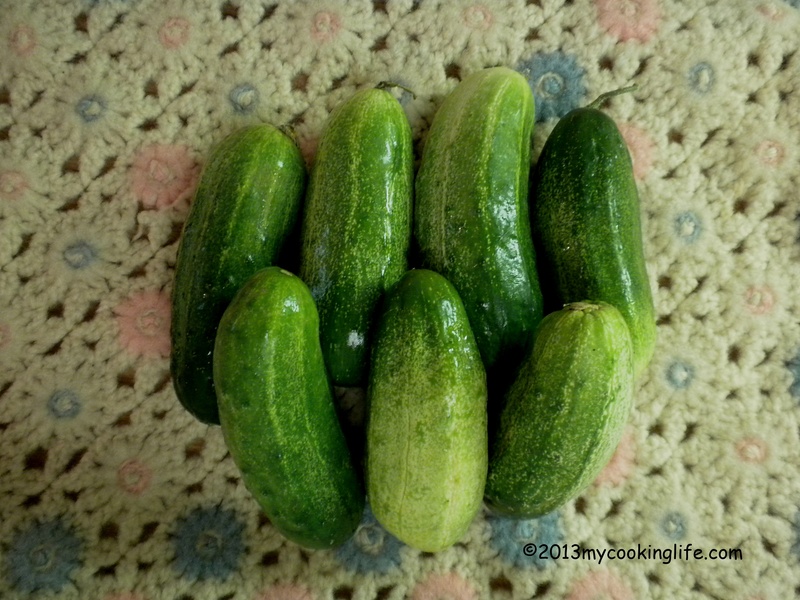 This entry was posted in Cooking, Recipes, Vegetables and tagged easy pickles, easy refrigerator pickles, Kirby cucumbers, Pickled cucumber, pickling, quick pickles, sugar-free dill pickles by mycookinglifebypatty. Bookmark the permalink. btw…grandchildren.You find an extra chamber in your heart that opens just for them! Yes they came out quite lemony and delicious! I am trying to be patient about having real grandchildren, Tonette! Thanks for commenting. Time for a peanut butter and pickle sandwich! Good! I love reading your blog. It’s the closest to a macrobiotic blog that I read regularly. And I also love the little Kirby cucumbers. Thanks Kathy! I tasted my first dill pickle spear today and it was very yummy after only 5 days! You are so funny! My husband and I both chuckled! I love easy pickle recipes. Adding this one to my recipe collection. That’s great and thank you!